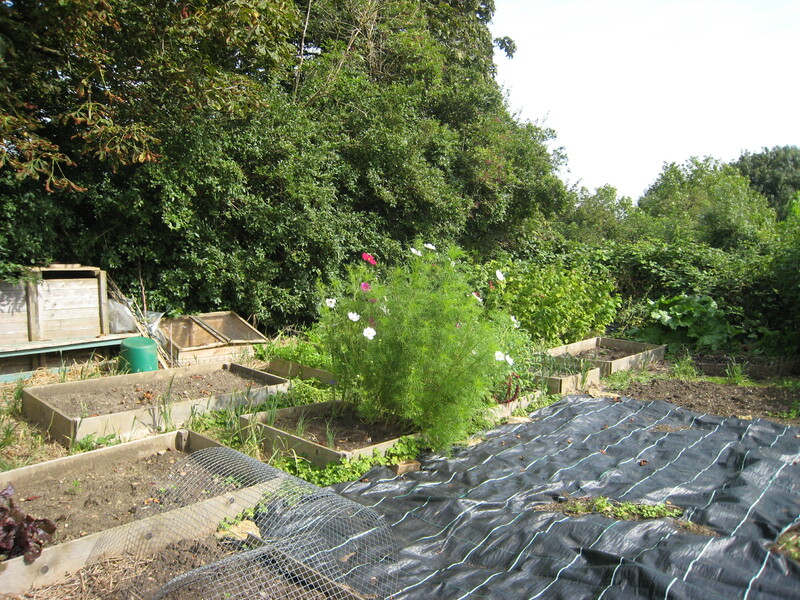 I can’t remember when I took on my allotment. 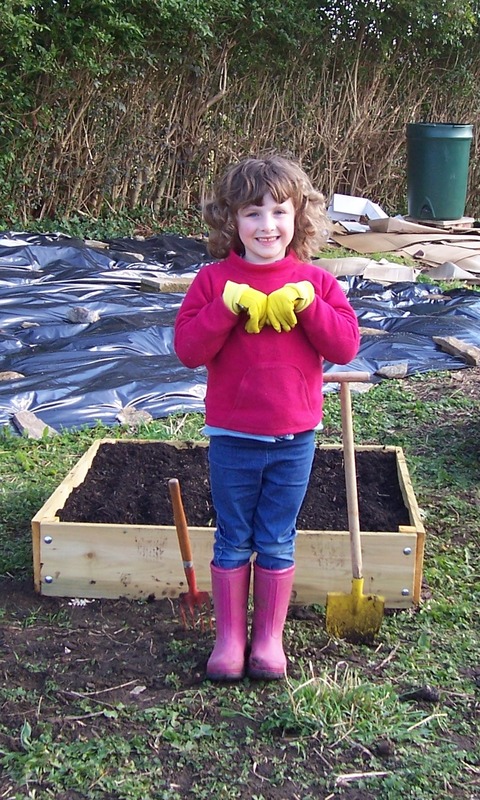 I know I applied for one when we first moved to Bradford on Avon and I waited nearly three years on the ‘list’ so it must have been ten years ago, judging by these photos of the children with their allotment beds. 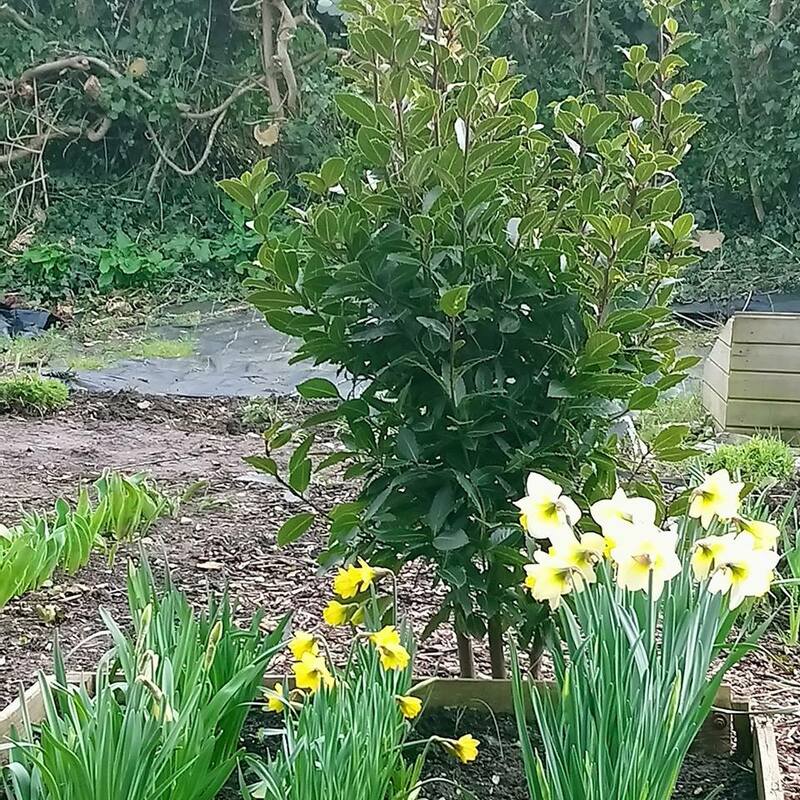 After months of clearing brambles, weeds and even mounds of rubbish which had been buried and covered with old carpet I started to grow potatoes to break up the soil and planted some raspberry canes, strawberries, gooseberries, currants and rhubarb. 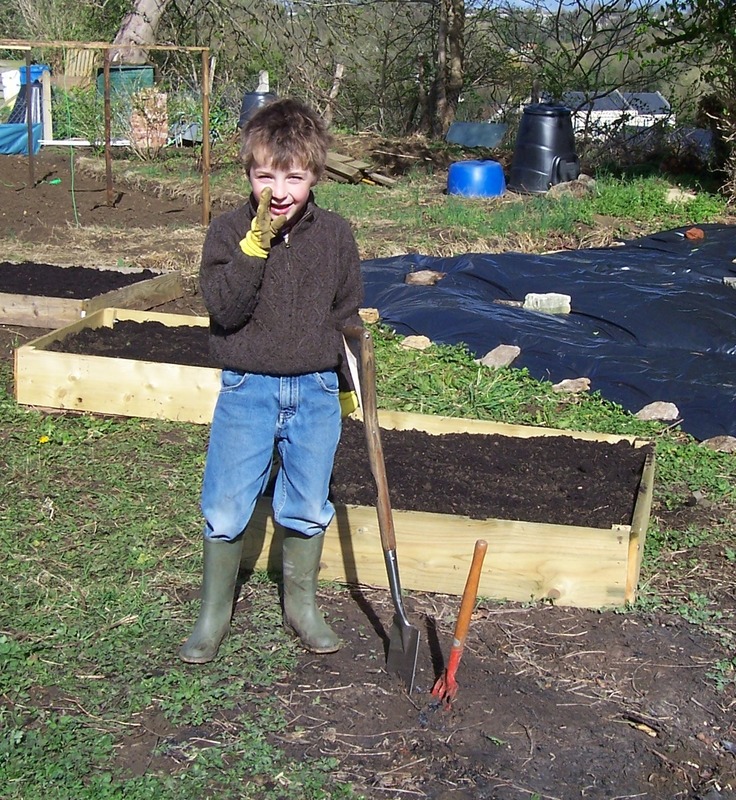 Gradually I laid some wood chip paths, built a double compost bin from recycled wood and installed some raised beds. 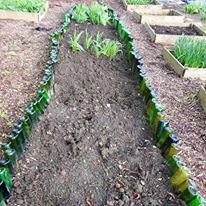 I coll ected dozens of green wine bottles which I used to edge the long cut flower bed and planted herbs and foliage plants to add to cut flower bouquets but I never really tamed it. 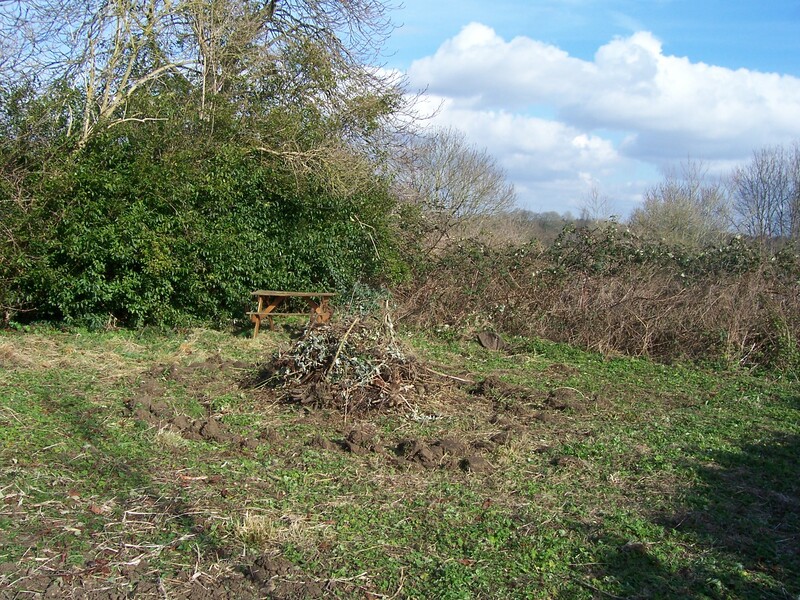 It was always on the edge of getting out of control as I fought back the encroaching br ambles, the council hedge which was rarely trimmed as resources were cut and the huge diseased horse chestnut trees and hedge on the edge of the neighbouring municipal golf course, which never were. 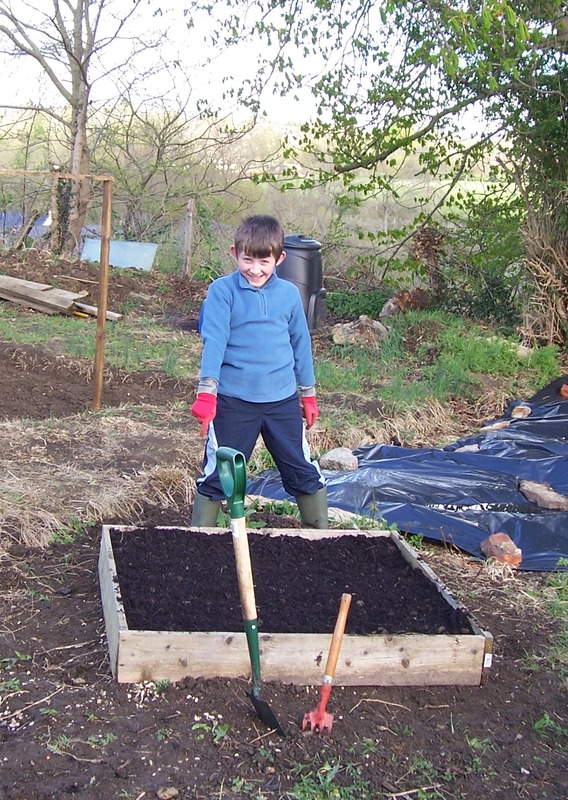 I have spent hundreds of hours on the allotment with the children when they were small and working alone as they got older and gardening became less interesting for them. They even coined the phrase ‘allotment time’ to describe my propensity for nipping over there for half an hour and coming back four hours later. 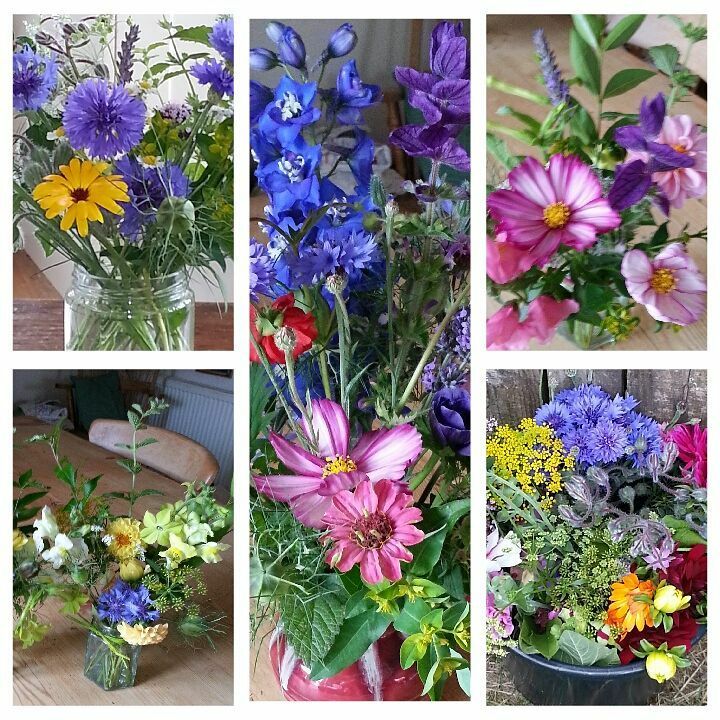 Best of all I have fed my family with homegrown produce and grown hundreds of my favourite flowers for cutting. In truth I have a difficult relationship with my allotment. I loathe the inaccessibility when it’s time to mulch with compost or manure, the lack of water – no standpipe and regulations preventing putting up a shed from which I could harvest rainwater, the visiting badger who is determined to dig up bulbs as soon as they are planted and knows exactly when the sweetcorn is ripe enough to eat and the occasional thieves who pop in and help themselves to whatever they fancy. I’m not too keen on the person who regularly allows their dog to defecate in front of the gate and doesn’t pick it up. But I love the space to grow, to be alone with my thoughts only two minutes’ walk from home and the memories of the children growing up playing archaeologists and then learning to grow things over ten years.And the herbs grow better on the allotment than in the garden. 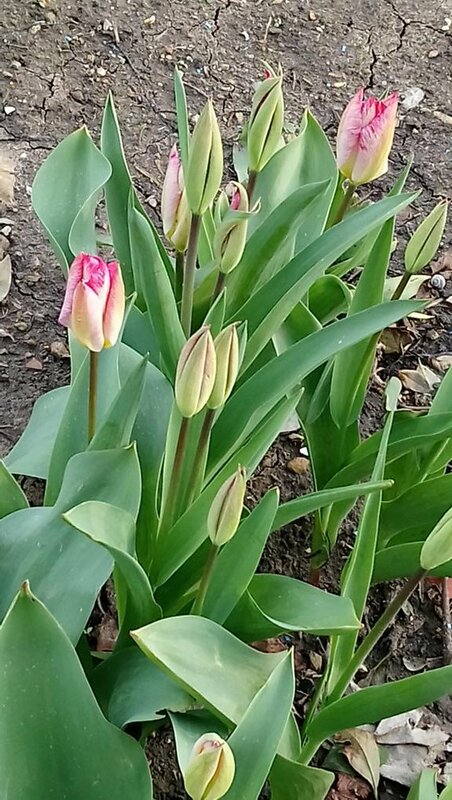 I have nurtured this little piece of Bradford on Avon for a long time but everything has its season and returning to the classroom has given me even less time to spend on growing. I need a space i can pop out to for ten minutes before leaving for work or whilst the supper is cooking and , in all honesty, it won’t be long before the children fly the nest and I want to make the most of the years we have left. I’ve put in two potager beds in the garden now that it no longer serves as a football pitch and so the time is right to let the allotment go. Over the last few months I’ll admit that I have struggled with this. I thought about looking for a partner to share the allotment but that didn’t seem quite right and now that I’ve made the decision to give it up I am at peace. I remain true to my precept of always leaving a place better than I found it. I hope the next keeper of plot 2b has as much joy as I have over there. I’m even a little excited to see how it develops in someone else’s hands. It’s understandable, the world changes and we change with it. 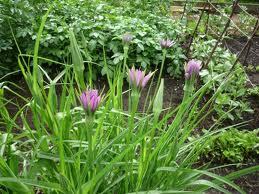 As you’re still gardening, be it a potager, you’re no less a gardener, you’ve just brought things closer to home. Good luck with this new chapter and I hope we’ll see more of your new project!